So, the quilt is progressing. Two more little corners, then I can swing into the border. I’ve had to retrace the design THREE TIMES. Because I used chalk. Well, the first time I used cornstarch because I read some stupid tip. One white me later, I decided it was a stupid idea. Anyway. Despite the apparent struggles of the chalk lines wiping off, I am looking forward to doing the swervy interlocking border lines. I’m thinking of binding it in black, what do you think? Emma has been crafty lately. 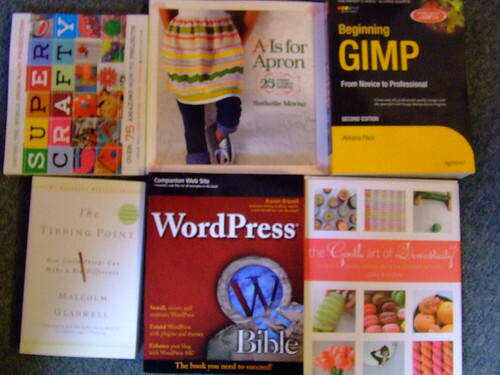 As you can imagine, being a long-term homeschooler who used to own a craft store, I have a tons of supplies. you know, just in case a crafting emergency breaks out. You never know. So I’ve been encouraging her to do more creative exploring and independent work. 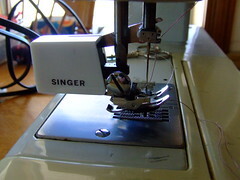 (She countered with “How about you teach me to sew on the sewing machine?” Smart kid.) Now she has something like 16 of these puppies. I got the Klutz book at a yard sale where these kids tried to sell it with half the supplies left, couldn’t then tossed it in the (clean) trash at the end. Yes, I snagged it. There were cardstock pages of small items to punch out and fold together, but these were gone. Emma traced the outlines and made her own. We got new eyelash yarn for the bodies and OF COURSE we had a plentiful supply of pipe cleaners and googly eyes or beads. 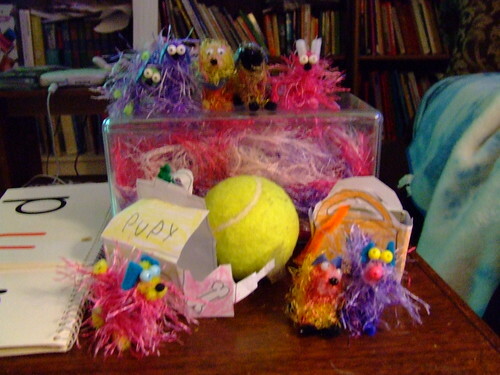 If you would like to adopt a wonky-eyes pipe cleaner dog (or kitty!) just let Emma know. Carrying case may or may not be included. And in case you are of the 20% of my readers who are NOT related to me, you may be unaware it is my birthday on Sunday. A very dear friend that I work with occasionally sent me a “little something” from my Amazon wishlist. I KNOW! I was pretty jazzed. Last count (I made a list) I have 22 quilts on the go. 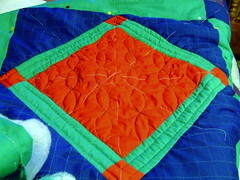 Over the years, I have completed three quilts. I fall down at the actual quilting part. I *love* picking out fabric. I *love* sewing the tops together. 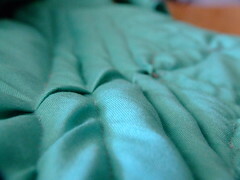 I fight & struggle and OW and moan about the sewing together of the layers. Hand sewing takes so long. I’ve been working on a hand-quilted twin sized quilt for Sarah since she was about 6 years old. machine quilting? My machine hates me. My other machine? Well, it had feed issue. As in, when you release the feed & drop the feed dogs, it still feeds. (Yeah, I know.) I am surely kicking myself now. So with a looming pile of quilt tops, and the fabric re-sorted into piles, half of which are uncut, things were urgent. Emma says I shouldn’t cut out any more quilts until I actually, you know, quilt. There are four completely finished tops waiting. 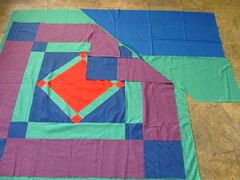 There are six quilts tops in progress. The rest are piles of carefully stacked fabrics no one is allowed to touch. One I am actually machine quilting. 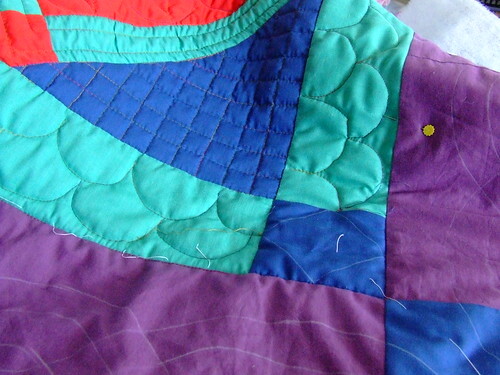 I had started trying to machine quilt it with what I had, then wound up unpicking it all. Yes, my family thinks I am nuts. I’ve basted and re-basted this puppy, trying to find what works best for me. My friend Jo said “omg, you didn’t already have one?! “ I KNOW! I sent my mom an all caps email & told her I was in love. I’m sure she’s deliberating which ones of her tops she can convince me to quilt for her. 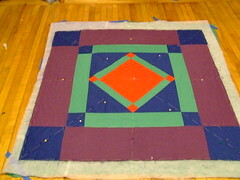 Last night, I did a substantial amount of some heavy quilting on this particular quilt with my brand new walking foot. I took small breaks, put Emma to bed and kept going till I was too tired and made a boo-boo I really had to pick out. It was only one straight line. This was earlier in the evening. The blue areas are all done now. This morning my arms ache. But it’s a good ache, you know? 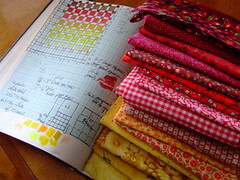 A word on the planned quilts: Like many sewers I have piles of fabric. My mom & I share fabric back & forth, plus I scour second hand stores & yard sales, as well as fabric shops, for any piece that “speaks” to me. This means I have a stash of fabric that needs its own room. If you knit, just replace “fabric” with “yarn” and you’ll relate. So, since I have also been on a cleaning tear lately and ready to chuck out half our belongings, on one of my much-needed mental breaks from work things, I played around with my fabric, got inspired, and groups things together in nice stacks for future quilts. I’m using what I have here, even for the backings. Some in the stash have people’s names attached to them too. The only thing I really need now is quilt batting. Also, I’ve been sketching some designs too, because I said at the first of the year I should do more art. It’s a nice break from work, and some days sorely needed. This is how I recharge, and I need to make sure I do it. 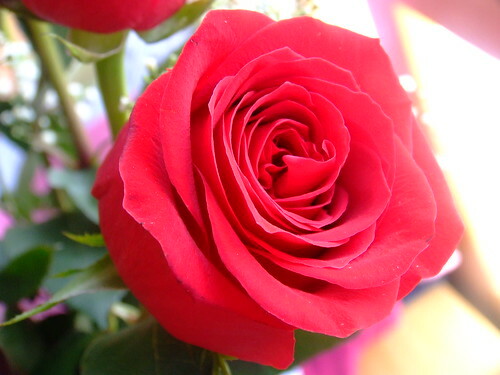 Today I have been married for twenty years. Huh. Well, would ya look at that. I have also officially spent over half my life with him. He can even still surprise me. I used to think that being married this long would be boring. Now I would do just about anything for a boring day. I could not even imagine being married to one person – just ONE – for all this time. Now I have one whole person who is my best friend, who pushes me to do better, who knows me better than I know myself, who loves me even when I drive him crazy. We’ve been joking for the last week or so, trying to hang on for “3 more days” to make it this far. Saying after this, we’re staring down the barrel of another 20. But oh! How lucky we are to be able to say those things in one breath and plant kisses in another.